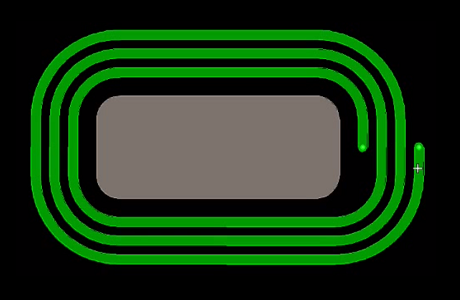 With the FloWare module Coil Designer you can quickly create planar windings for transformers in OrCAD PCB Editor and Allegro PCB Editor. The generation is controlled with variable parameters. There are four general shapes available round, rectangular, hexagonal and octogonal. With changes in the parameters in the menu the dimensions or number of windings will be dynamically updated in the preview at the cursor. Corners can be mitered or rounded off with a parameterized radius. Within a structure a keep out area can be generated as well with a spacing towards the inner winding. If you want to place a via at the beginning and end of the winding, you can select an available via type. Winding direction can be clockwise or counterclockwise and the geometry can be rotated, mirrored and scaled. If all your settings are satisfying you can select if you want to generate the winding as a bunch of track segments or as one shape. If you need to generate a multi layer transformer, just place it with the same settings again onto another layer or use two different parameters for even and odd layers.